Selenium functional tests can be converted in NeoLoad to use them for load and performance testing. They become highly scalable, protocol based, load tests that can be launched and analyzed into NeoLoad, the market leading performance testing platform. 100% Automated Script Maintenance with Selenium Scripts. When the application changes, testers can leverage the NeoLoad User Path Update feature to automatically update load tests scripts converted from Selenium. This means script maintenance becomes fully automated and saves the time and efforts required for load test updates. Script conversion and automatic update is supported for Selenium scripts in Java and C#. This lets the majority of testers use the Selenium and NeoLoad integration to synchronize functional tests and performance tests. Agile teams, DevOps organizations, and anyone looking to automate their testing process can be more efficient than ever. 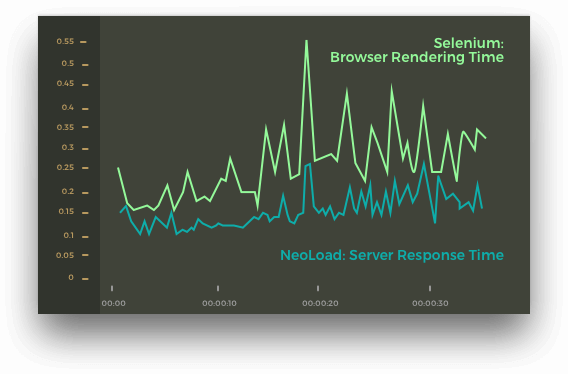 NeoLoad can gather browser-side metrics by automatically launching tests in functional testing tools like Selenium and other Java-based tools during a NeoLoad test. These metrics are collected in NeoLoad dashboards enabling you to understand the complete end user experience, on the application server side and on the end-user side.